Hopkins put a couple nasty spin moves on the Dallas defense to set up the Texans' game-winning field goal. The Houston Texans beat the Dallas Cowboys 19-16 on a Ka’imi Fairbairn 36-yard field goal with 1:50 remaining on Sunday night at NRG Stadium. That field goal opportunity was set up by an absolutely ridiculous effort from wide receiver DeAndre Hopkins on the drive. The Texans had 2nd-and-9 from their own 24, when Deshaun Watson found Hopkins just across the 35-yard line, and the star receiver showed off his outstanding playmaking skills. 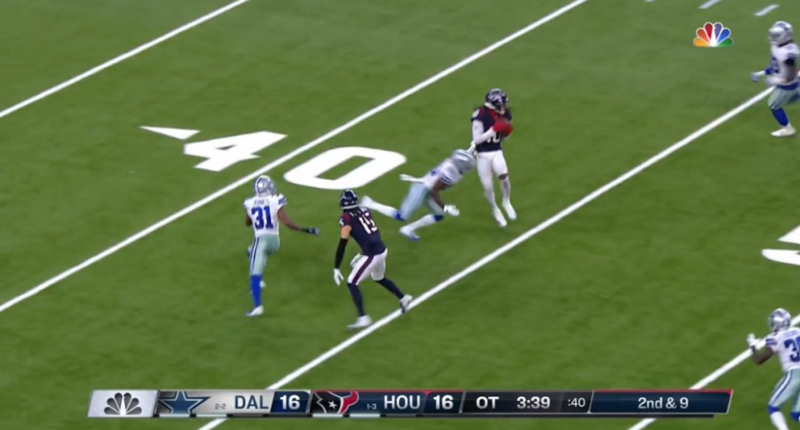 Hopkins dropped multiple spin moves on the Cowboys, turning roughly a 12-yard pass into a 49-yard gain that put the Texans in game-winning field goal territory. After a few Alfred Blue carries, Fairbairn then kicked the field goal to give the Texans a 2-3 record on the season. The Cowboys fall to 2-3 with the loss.